The seventh issue of the monthly Dark Horse comic series, Star Wars: The Old Republic, was published on this day back in 2011. The Old Republic: The Lost Suns is the third story arc in the The Old Republic comic series and a tie-in to the Star Wars: The Old Republic multiplayer online role-playing game. The story is set approximately 3,600 years before the films and the story centred around Republic spy Theron Shan, son of Jedi Master Satele Shan, and packs shocking revelations to the events of the then upcoming Old Republic video game. 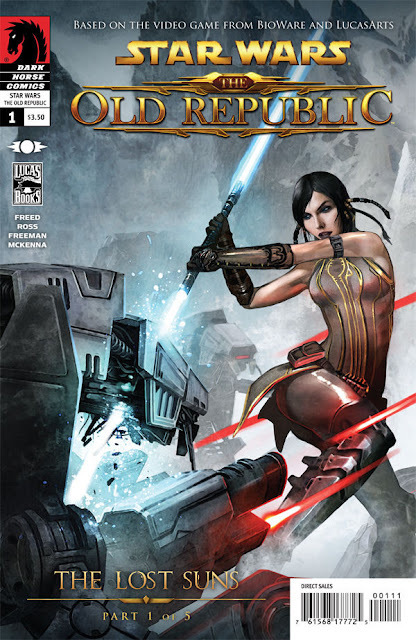 The series consisted of five issues released monthly, with the first one published on June 8, 2011 and was written by Blood of the Empire author, Alexander Freed. Star Wars fans would get their first live-action glimpse of Jedi Master Satele Shan in The Old Republic cinematic trailer which was released in September 2011.
Who remembers watching this iconic Old Republic trailer? Who has read this Dark Horse Comics series? Let us know in the comments below.